Peruvian cuisine is one of the most varied in the world, with more than 400 typical dishes. Many of them express the strong tradition of their Inca origins. Others, however, have Spanish, French, Cantonese, Japanese or Italian influence. It is one of the few countries where you can find flavours from several continents in one place, all the while continuing to express its Peruvian identity. Its gastronomy is so delicious that some of its dishes have crossed borders and are popular worldwide, such as Ceviche. Here you will find the list of typical dishes of Peruvian cuisine that you can not miss in your holidays to Peru. One of the most traditional and tasty stews in Peru. It is also one of the oldest since it is said to be a common dish among the Inca popular. It contains boiled and fried potatoes cooked with pork and chicken meat, seasoned with panca and mirasol chilli, as well as other spices. A delicious and very rich dish. The Peruvian dish, best known worldwide is of pre-Columbian origin. It consists of a cold salad with chunks of raw fish seasoned with lemon juice, onion, salt, hot pepper and cilantro. In Peru, it is considered the national dish and sometimes it is accompanied by sweet potato or yucca. In other countries of Latin America, you can find a variety of different versions of this dish. This green creamy sauce is traditionally from the Arequipa region and is often used as a dressing for boiled potatoes or on salads. The sauce is made with evaporated milk, chilli, grated cheese, peanuts, huacatay (a native herb), salt and oil. It is usually accompanied by hard-boiled eggs and olives. It is one of the staple dishes for Peruvians. As the title indicates, it is a piece of chicken cooked on the grill in a special oven called a rotombo that turns itself. It is most commonly accompanied by salad and chips. It is one of the cheapest meals in Peru and can be found in almost all of its restaurants and cafes. One of the most typical dishes of the country, especially in the mountains, for that is where the ingredients can be found. It is a mixture of olluco, a type of potato that is grown in the Andes, and charqui, flame roasted meat. The dish is seasoned with onions, chopped tomatoes, chilli and other spices. It is often accompanied by white rice. A classic of the typical Peruvian cuisine of the city of Huancayo, in Junín. It consists of a plate of potatoes covered by a yellow pepper sauce with milk, oil and fresh cheese. In some places, it is accompanied by rice and it usually has a boiled egg on top. It is one of the most traditional dishes of Arequipa, where you can find it in any restaurant in the area. It consists of rocoto, a typical Peruvian fruit similar to a chilli pepper and equally as spicy, stuffed with minced meat seasoned with onions. A true delicacy of Peru, it is one of the most typical desserts of Peruvian gastronomy. 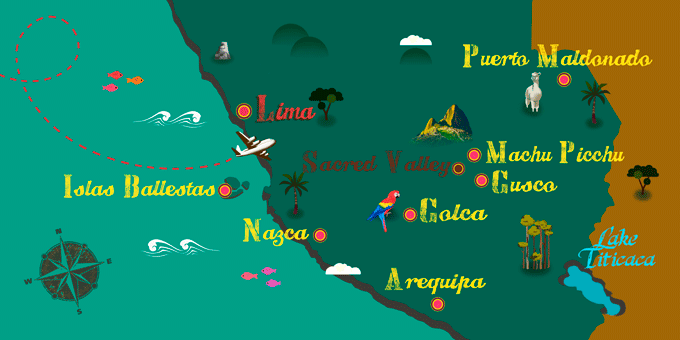 Its origins date back to the 19th century and the city of Lima. It consists of a cream of milk, egg yolk, almonds and sugar. Sometimes it is accompanied by vanilla and, in many cases, topped with meringue. One of the most traditional and popular dishes of Peru. Potatoes are mixed with oil, lemon juice, salt and pepper, and mashed into a puree. The potato layers are filled with layers of tuna or chicken and vegetables and then rolled up. In some restaurants, they decorate the top with sauces.